If you have multiple cloud storage accounts – Box, SugarSync, Amazon S3 and other popular cloud services, this may lead to the nuisance of not being able to manage each of them efficiently. Luckily, a cloud management online tool – MultCloud can help you to solve this problem. It is a FREE web app. 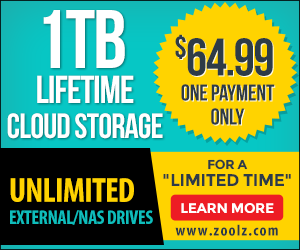 Moreover, with it, you can add cloud drives in it freely to get unlimited cloud storage space. 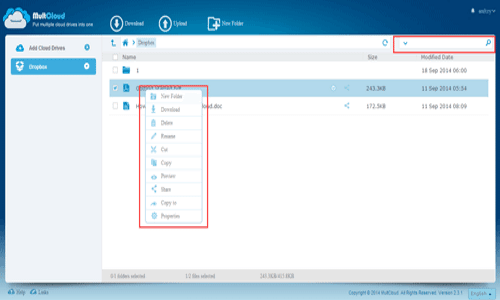 With MultCloud you can put multiple cloud drives into one Free App for Managing Files across Cloud Drives as if it were the Windows Explorer. 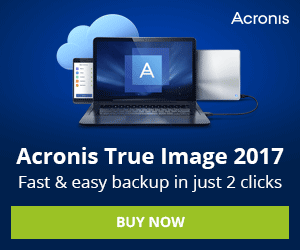 It comes with all-in-one files management, including upload, download, cut, copy, paste, delete, rename, search, share and so on. 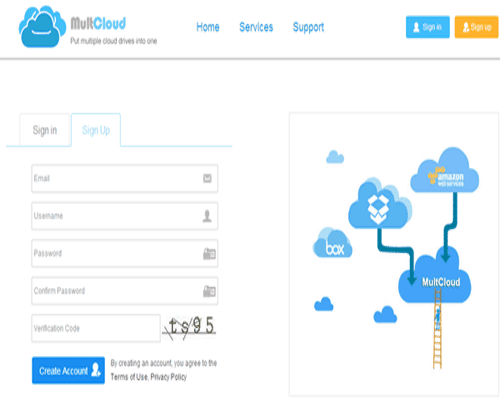 MultCloud is a website built entirely service developed by AOMEI Technology, the same people who made famous partition management software – AOMEI Partition Assistant and backup software – AOMEI Backupper. It is free and quite easy to configure, only takes a few minutes for setting things up by your email address, username and password(twice). 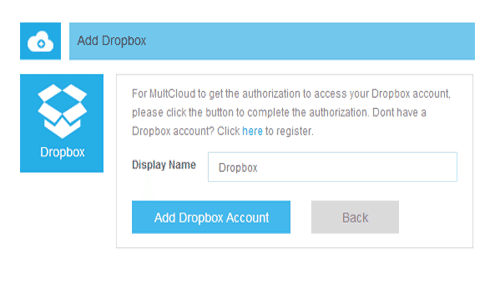 At first, open your browser and input www.multcloud.com, click “Create An Account” or “Sign up” to get started. Once you have completed the form, click “Create Account”, then activate your account in your registered email. Log in MultCloud and begin to add cloud drives. Pick one of them and click “Next”. The username and password of the cloud drive accounts that you added into MultCloud will not be recorded in MultCloud’s database. Because the authorization system of MultCloud is OAuth, which is a standard authorization framework that enables third party applications to access to cloud services without username and password. Google Drive, OneDrive and Dropbox and so on support for the OAuth authorization. So no one will be able to get the password for your cloud drive accounts as well as MultCloud. You just need to sign in to those accounts and grant permission to MultCloud. Currently there are 17 services, besides cloud drives, but also WebDav, FTP/SFTP. You can add even more than one account of the same service. The display name must be different. Now keep adding until all the ones you want are in your MultCloud account. 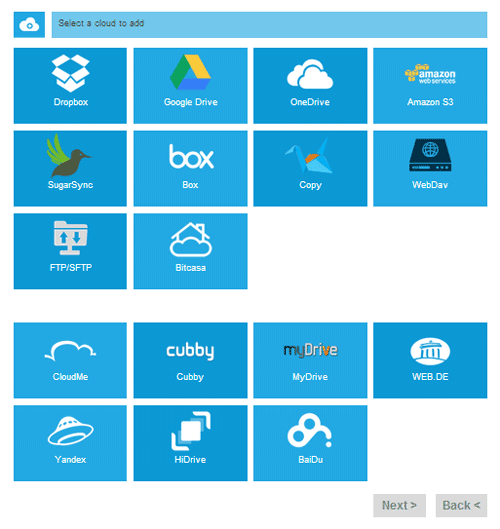 Finish adding cloud drives in MultCloud. You will find it is not too different as using a regular file manager on your computer, right click a file or folder in one cloud drive listed on the left panel of MultCloud’s interface, you will see many practical and interesting operations: Copy&Paste, Copy to(move/transfer), Rename, Cut, Delete, Preview picture or word, pdf, etc. There is a search box on the right top of the main screen. To find your target files only need enter a keyword. How useful! Of course, transfer speed mainly depends on your upload/download bandwidth. The moving process is on server level. 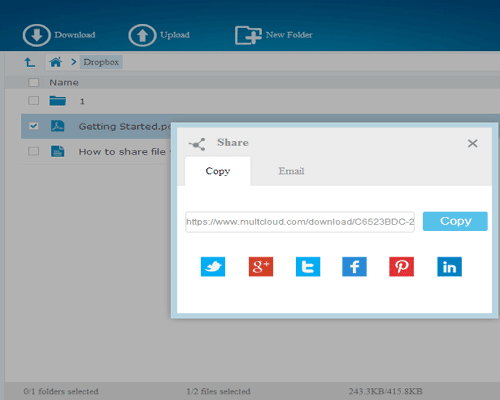 You can also share file to your friend by emailing and link sharing. In a word, MultCloud is a great idea and it shows a lot of potential for the future.